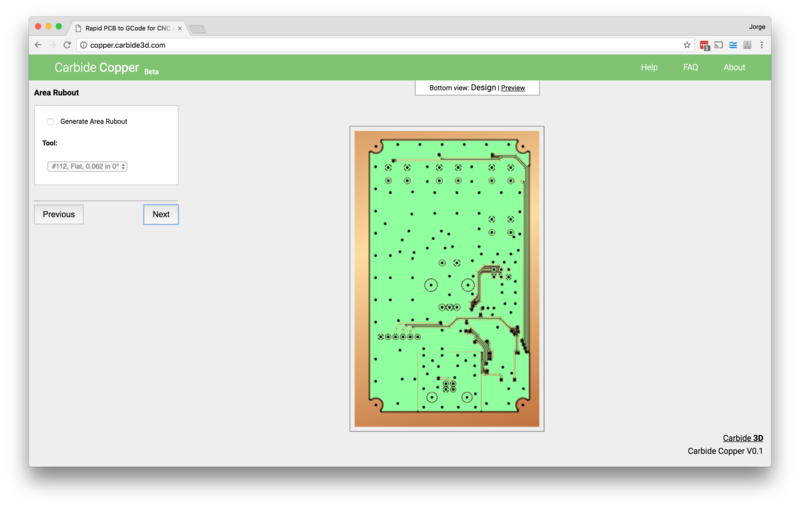 Carbide Copper is a free tool from Carbide 3D to allow you to make a PCB with your CNC machine without any chemical etching. It is currently available as a beta. In the right-hand menu, select inches or millimeters as your preferred units. Enter the dimensions under Material Size. Navigate to the your gerber file, then click Open. It’ll take a second or two before your file loads in the preview. 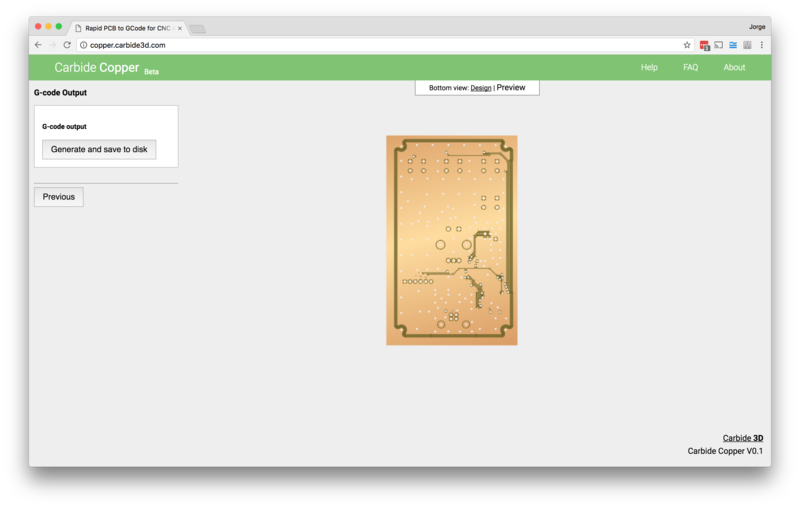 NOTE: You can also drag and drop your gerber file into the dotted window. Under Tool select the #501 Vee bit. Select 3 for the number of Isolation Passes (the number of passes around the edge of the board and between traces). Click Choose File and navigate to the excellon drill file, then click Open. Verify that the drills match the location of pads and vias on the board. If you need to apply an offset you may do so under the Position menu (by default Carbide Copper uses the same offset as the signal layer). Select a tool under Drilling, leaving the default Plunge Rate. NOTE: You can also drag your drill file and drop it into the dotted window. 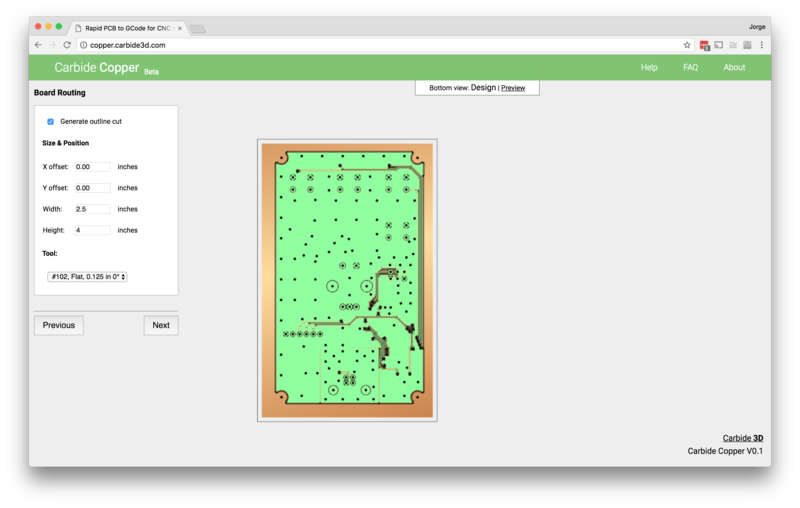 Check the Generate Outline Cut box and enter dimensions for the board cutout. Under Tool settings select the #102 endmill to cut the outline. Click on Design at the top of the page and verify that the cutout doesn’t interfere with any traces or drills. Area Rubout removes copper from the board that isn’t part of the layout. This is typically required in high frequency or high voltage designs, where the extra copper can alter electrical features. It adds significant machining time and is not necessary for most applications, so we’ll leave Generate Area Rubout unchecked. To save the gcode, Click Generate and save to disk. Place the generated nc file in a convenient place on your computer. To make PCBs with Carbide Copper, we need to export gerber files in 247X format. For this guide we’ll use a single sided board with 10 mil traces and 10 mil isolation. We’ll export gerbers using the Carbide 3D CAM file. 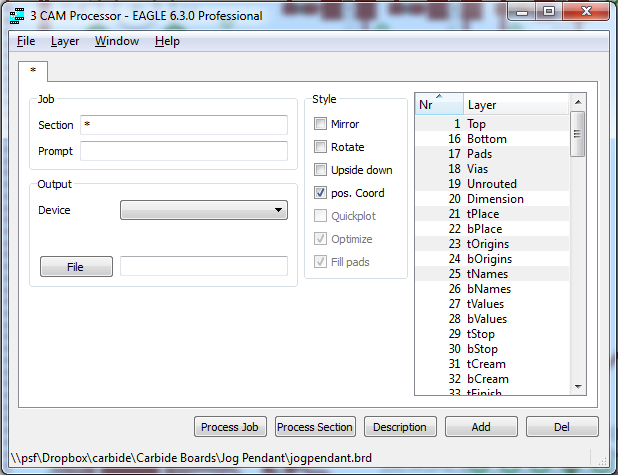 If you do not have the Carbide 3D CAM file for eagle, you can get it here. Gerber files are the industry standard format for manufacturing PCBs. They’re a hybrid of machine control language and image that describes each layer of the board. To make things simple, the Carbide 3D CAM file only generates the gerbers we need for milling with the Nomad. NOTE: The .gpi and .dri files are automatically generated by Eagle and can be ignored. 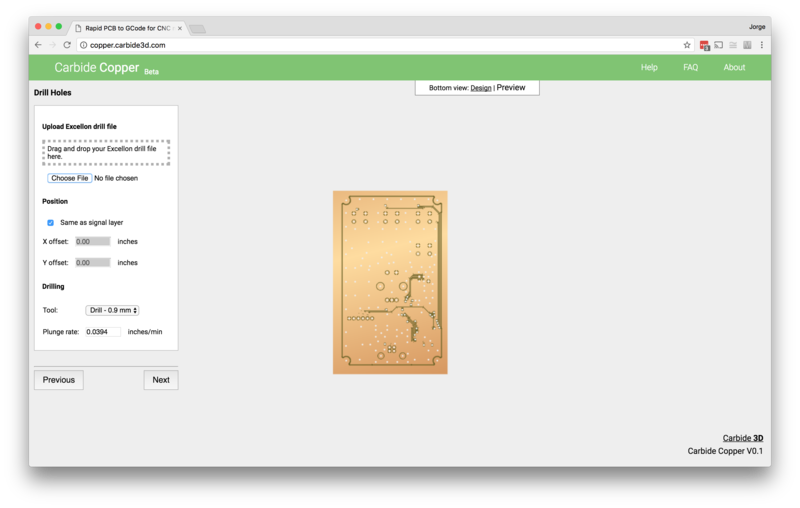 Open your board in Eagle, and load the CAM processor by clicking the CAM icon. Go to the File menu, then go to Open > Job. Select the Carbide3D.cam file and click Process Job. Once the gerbers are processed you’ll find the files in your project directory.